I got this great idea from Pinterest to put little snacks in used up coffee creamer bottles. So, I actually remembered to save the bottle (Go Me! 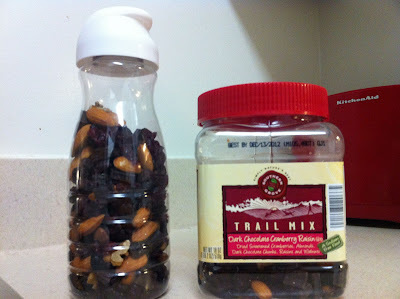 ), rinse it out (Cheer for me again, I never actually DO these things) and one morning this week, I poured Michael some trail mix into the bottle. I thought it was such a perfect idea, because since he doesn't have use of his fingers, he can be a little messy with snacks. Note: Brokaw loves when Michael does anything in the kitchen. Often, if I leave Michael a snack out that he can get to easily, it's in a Red Solo Cup. No offense, Toby Keith, but I just don't like the way those things look, and the snacks don't stay fresh! That doesn't bother Michael, of course, but it just doesn't fit well with my OCD. So. I was all happy that I actually lived out something I saw on Pinterest. I left the bottle of trail mix out for M, feeling very proud of myself. I got home from work. M thanked me for the trail mix. And then told me he dropped the bottle, and Brokaw ate it. It was fun and resourceful while it lasted. And we do have one more bottle of coffee creamer in the fridge that I will do this with again. Okay, the ending to this made me laugh! That is funny that your dog ate it! The best laid plans, right?! But really, that is a good idea and sounds like a resourceful solution. And I use so many flavored coffee creamers I could send you one for every day of the week! :) Great idea. One of these days I'm going to have to get on Pinterest I guess. I just cleaned out a coffee creamer bottle to try this! Ours still smells like the creamer though, so I'm hoping another soak in super hot water will help (without melting the plastic lol). Hopefully the containers end up working out for you guys!